Home design trends continue to change at supersonic speeds. With New Year right around the corner, the home design world is focusing on trends that will probably reign big in 2019. So, as you make your annual resolutions or consider revamping your home, it’s worth knowing them. After all, we all adore coming back to a place that makes us happy and helps us disconnect from tough days at work. It’s wise to be aware of temporary fads in design, but don’t be shy to try some new home designs and decor in 2019. In this post, we explore five trends to watch out for in 2019. Blending outdoors with indoors continues to trend and is not stopping soon. Today, the idea enjoys a boost from state-of-the-art accessories made from natural elements to complete the appearance. Natural fibers, wood and rattan are getting indoors, helping to blur the lines. Terrazzo, a hard stone with chips of granite, glass, marble and quartz reigns with its speckle signatures. Terrazzo was popular in the 80s but making a comeback in 2019. Because of its versatility, terrazzo is preferably used on countertops and not floors. This comeback will likely take away from marble’s more recent popularity. Though white remains a classic color for most kitchen designs, homeowners are injecting vibrant colors and shying away from bland hues. Rich colors, including wood tones and neutrals like mahogany, blues and grays are making their way into kitchens giving them a fresh, warm and unique feel. Social media platforms like Instagram and Pinterest play key roles exposing homeowners to the endless possibilities and fun of rich colors, encouraging them to be risk takers when it comes to color. Blues are gaining popularity in interior dress ups. 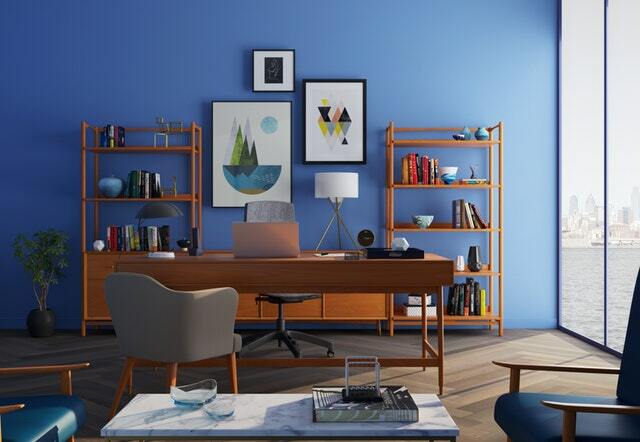 Most paint companies prefer shades of blue as their top choice in 2019. Blueprint is often seen as warmer than denim and softer than navy. Blue is perfect for reflecting the pool. The coloration is also popping up in home accessories like artwork, pillows and throws. Though tropical palm prints remained popular this year, people aren’t tired of the look quite yet. In fact, eye-catching, oversized florals will probably dominate throughout 2019, with more complex interpretations expected. If you are in the market for a new home or interested in refinancing your current property, be sure to contact your trusted mortgage professional to discuss financing options.